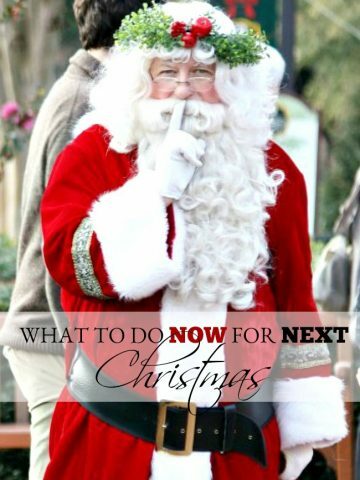 Taking down Christmas decorations and putting them away can be quite a chore! 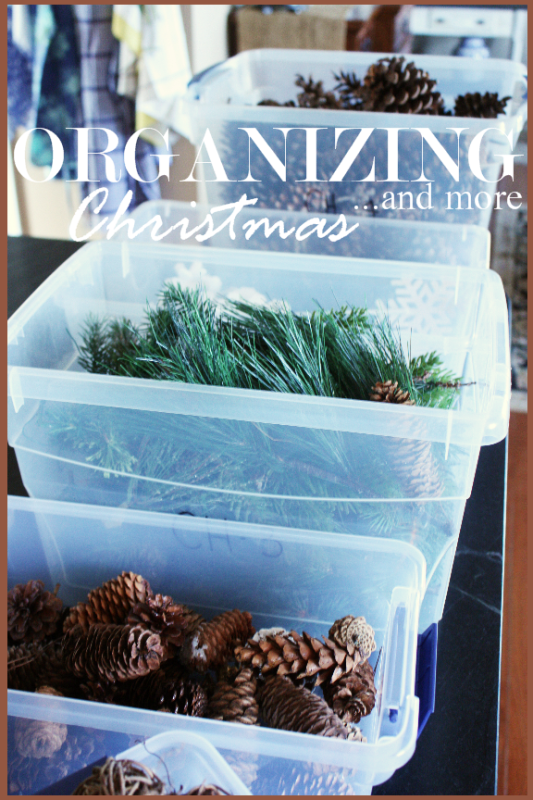 I knew there had to be a better way of storing and organizing Christmas… I was throwing all the decor in big plastic bins and it was getting so out of control! I used to keep a list of what was in each mammoth bin… but that got so overwhelming. And digging through each huge bin to find the few things I wanted was such a waste of time… and made a mess! First… I am getting rid of most of my big bins! They are just too big and bulky and full to make finding things easy! That being said, a few things just fit into those bins better.. so I’m only using them when I absolutely necessary. The smarter thing, for me, are smaller, see-through bins. 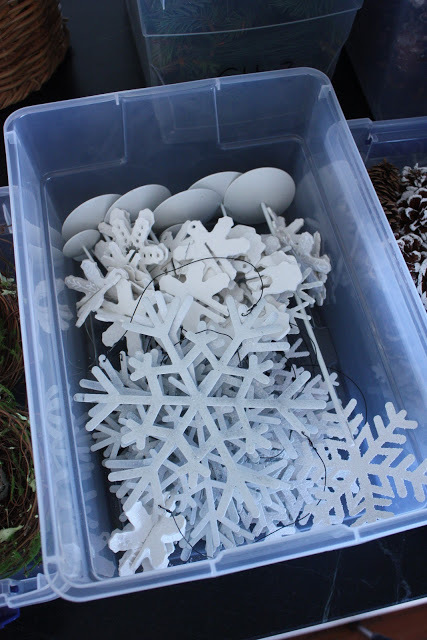 Most of my Christmas decor are smaller elements, so they fit better in smaller bins. I’m sorting and editing EVERYTHING! The next step was to label each of my boxes. I labeled each box that hold Christmas decor CHRISTMAS and then assigned the box a number. Then under the main label I wrote a general description of what was in the contents of the box. They will go down to the basement and be organized on metal shelves… I’ll post about this later! Then I put them all in a file in my computer labeled Organization/Christmas. 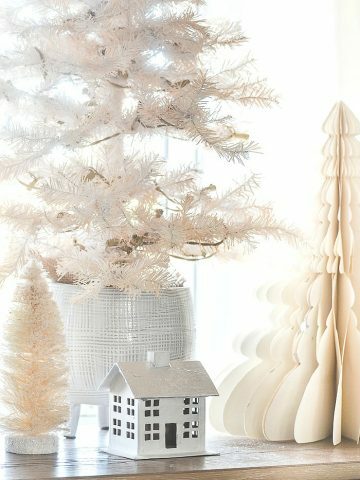 Now I have a complete visual inventory of my Christmas decor in one easy to access place! As I add to or edit the boxes I can take a new picture, edit the description and put it in the Organization/Christmas file. I don’t have to run up and down the stairs to search through big bulky bins! I can even take my ipad to the basement with me and search for what I want before I even get into the boxes! Another great bonus is I can search my inventory on my computer when I am looking for element to use as a tablescape or for any other decorating without searching through big bins! HURRAH! It will also be easier to put things away too! I have a basket designated for collecting things that go to the basement… all I have to do is look up their home on my ipad or computer and I can easily put them away!!! As I organize my basement this year (one of my New Year’s resolutions) I will convert all my bins to smaller, see-through boxes. I’m making a very big effort to PUT AWAY… GIVE AWAY … AND THROW AWAY every last thing in my basement and garage! I’ll keep you posted on my progress and how this system works. This may be a little too intense for some of you, but I need a system that gives me an easy way to find things almost effortlessly, so I don’t mind a little extra work and expense on the front end to keep my life in order! There are few things that can frustrate me more than not being able to recall where things are… and the time wasted in searching for them! Hopefully, this system will help! I’d love to hear your best organizing tips!!! Remember TUTORIAL TIPS AND TIDBITS is here tonight at 8:00 pm. Genius! I love your blog. Best wishes in 2015. I’m looking forward to your posts! I start take down on Monday! LOVE my Canadian followers!!!! Thanks Sue. How great to be so organized! I like what you are doing. We use the dark deep bins (what we had) and divide them into colorways/seasons. I have a red bin, two white, one gold and silver and a blue one. All corresponding colored ornaments go into the bins, as I decorate my trees by color. I decorate for 3 seasons: Winter, Summer and Fall. All in all, I am lucky I have an upstairs closet that holds the bins, but it could look better. Thanks for those great tips! Your home is an inspiration to me and your words, as well! I have an obsession for those particular bins- I buy them whenever they go on sale, and I never seem to have enough of them! I’m still using the giant bins for Christmas, but this year I did consolidate all of the sentimental stuff that I don’t actually use into one bin so that I don’t have to rifle through it next year. That’s pretty organized for me! Stopping by from DebbieDoos pinterest party to pin your ideas Yvonne. I invite you to come to my house and organize my mess! I am taking lessons from you! Wow, you do a fantastic job organizing the Christmas decor. I always start off doing so great, and before I know it, I’m just stuffing it back in the containers. 🙂 I just pinned this on both of my accounts! Thank you so much for sharing at A Bouquet of Talent this week. I am so happy to have you share, and I am featuring this great post. Wish you lived nearby and I could hire you to do this for me….only, I don’t have a basement. 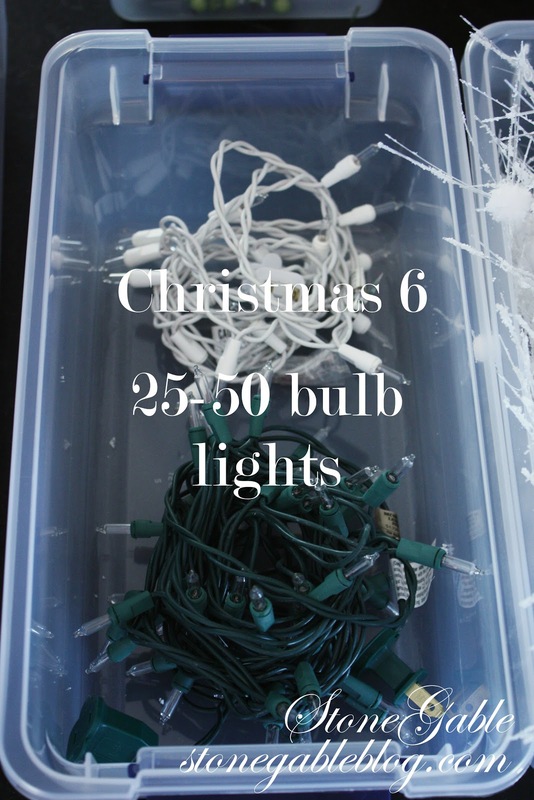 I do store my decorations for other holidays in those types of boxes but haven’t weeded my Christmas decorations down enough, still have large items that need the big box….I did decorate less this year so perhaps next year, if I’m wanting to do less again, I get rid of some of the bigger items. Yvonne, come by later this afternoon and see my latest post. I had to rave about this post on my post!! really appreciate your shares!! 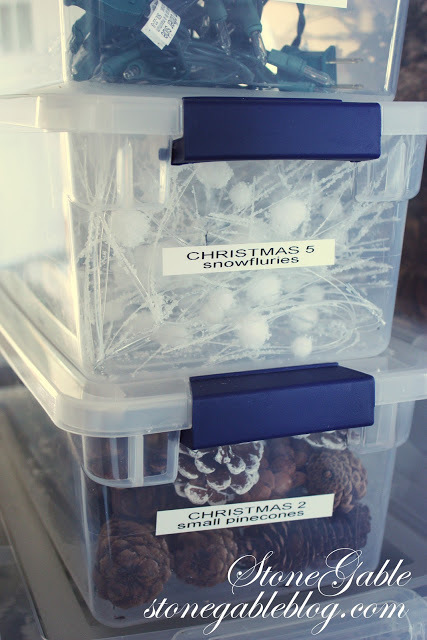 I just love those clear bins.I also started to organize my Christmas decoration this year. As I get older it makes life a little easier on the brain to be able to see what is in the bins. I strted using the clear bins for all of my fabrics and trims. I sort the fabrics by color and texture. I only wish I had a basement to store everything in. Good post! We are putting up maybe this weekend. We have had company off and on the entire time and loved every minute of it. I changed things up this year and did not use every thing. Jim puts it all away in clear bins big and large. Tossing worn out and non sentimental decorations happens for us before and after. I think we finally have our intercontinental homes merged well; it just took us 3 years after our return to Lancaster! Great post and great ideas!!! A little too intensive for me. This is what I have done…..also using smaller see through containers, but still have the large see throughs for all the ornies. I have 2 shelf units in the basement that are just for Christmas, everything in one spot!!! And I continue to purge every time I pack and unpack. Spring and Summer are on another shelf unit, and Fall on another unit. That keeps me organized and I don’t have to search though boxes, don’t need photos of it all as I can see through the containers. The important thing for me is having like items corralled in one spot. Now, if my kids would come and get their stuff out of here my basement would be perfect!!! Brilliant! Nothing better than organizing Christmas, it insures a stress free time of decorating next November! 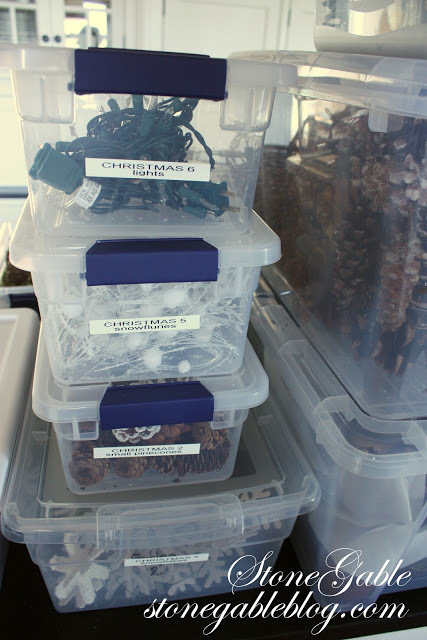 Your wonderful ideas take organizing up a notch- I use shoe boxes with labels inside of those big tubs, but next year I’ll follow your lead and get clear plastic boxes to replace the shoe boxes!!! Awesome! Luv it. 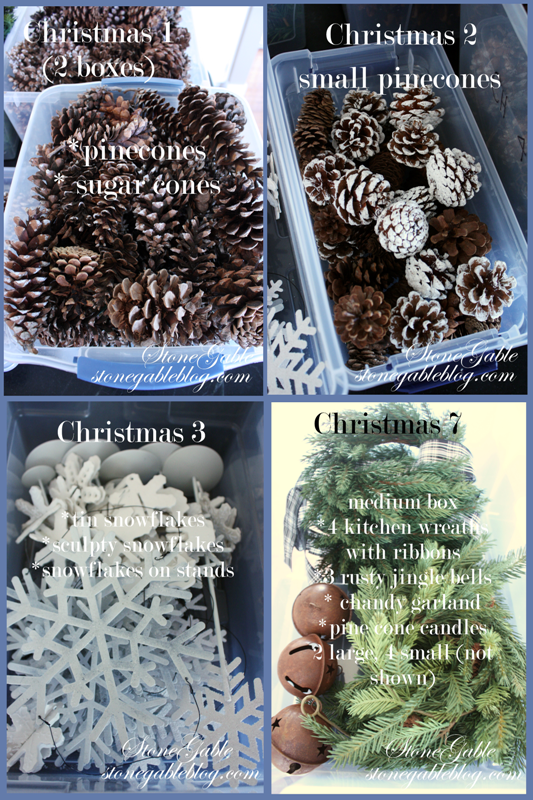 I will use ur tips as I finish my craftroom clutter and move on to putting up Christmas. Us Texas gals don’t have stairs going down..ours go up into firey attic space. Thanks Yvonne, I KNEW you’d have a well thought out plan, and you certainly got my attention with the visual inventory. That is brilliant! It can be so frustrating searching and searching or WORSE forgetting some of last years purchases. 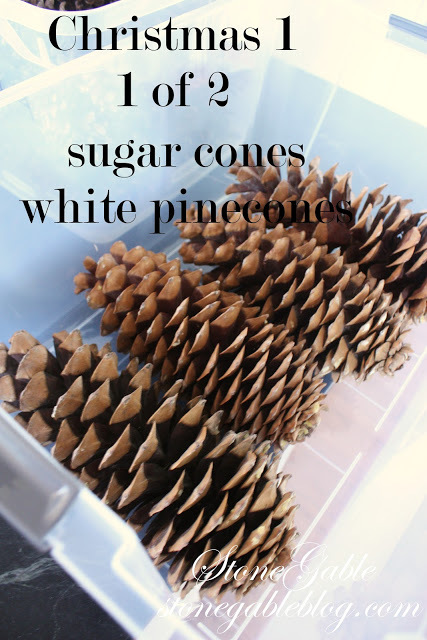 I can see how wonderful it will be to find something quickly for a tablescape too. I hope to SEMI accomplish a similar system, with a visual inventory on my computer. Too fabulous!Thank you so much! Now that we are moved into our “forever” house, I have the decorations sorted in boxes by the room they go into. That makes it easier to do one room at a time. This doesn’t mean that I don’t move things around. I also take photos of the rooms once they are decorated for the holidays so I can remember what I did in previous years that I liked. Great!!! 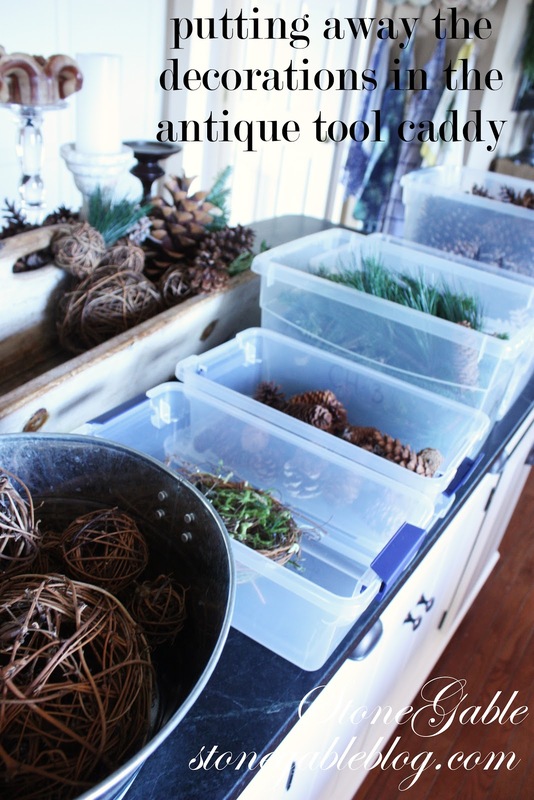 Smaller containers will be a lot easier to get in the attic. Since I am the one to climb the ladder. Now if I can a purge and get rid of LOTS of things. Great idea Yvonne, but I don’t think I’d make it through all of my decorations! Way too many boxes. But you do have me spurred on to take some photos of my boxes as I put them away. That’s organization at its finest! I love the idea of taking pictures of what’s inside each bin. Thanks for all those great tips! I do something like this for all season. For Christmas,I label my boxes by rooms. So if I am ready to decorate the kitchen, I pull out the kitchen box. Other seasons are just labeled whatever season. I think I should own stock in Rubbermade or Sterilite. Wow – I am in awe of your organization. I do store in clear plastic boxes – but all of them are mixed up Christmas and I have to go through all of them to find anything. I think your idea of smaller boxes is certainly the way to go. Great ideas! 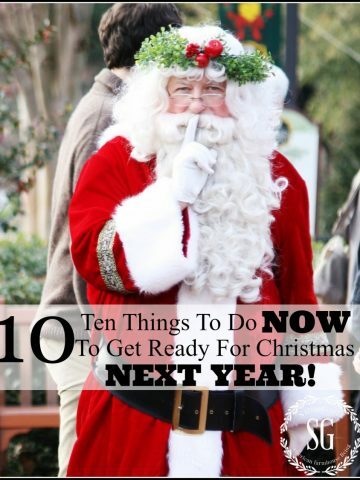 I’ve got to do some big purging before I put things away this year. I love your idea of smaller bins Yvonne, mine are so big I can’t lift them anymore. Thanks for the great inspiration. WOW. That is truly impressive, Yvonne. Too bad I didn’t have this earlier, haha. I did that very same thing with one exception! I still use the card catalog method. My tubs are on the shelves. I just opened up three boxes and was done in a flash! for Tutorials Tips and Tidbits!!! you have such a great idea here. never thought of downsizing the tubs to smaller ones, but it certainly sounds so much easier. This is really detailed organizing! I have bins and I label them and so far that works! I like your system and may consider it for some of my other larger bins. Great tips! I was planning on doing something like this but while I was grocery shopping my daughter asked if she could pack up a few things and I told her to go for it! By the time I got home, she had packed up everything except the tree. It may not be organized the way I wanted it but it’s done and I don’t have to worry about it for another year!!! i’m no where near that organized but i have been using clear bins as they are so much easier to tell what’s in them….i also use color coded bins (orange for fall/halloween; pink or lavender for easter, etc) and clear for christmas. i also made up index cards and taped them inside the bins on all 4 sides so we could easily tell what’s in them. the only problem is i only started doing this last year and there are still too many bins unlabeled or not clear so we have to look through all of those as well. i know i have way too many decorations and need to go through all of them to pare down…hubby hates taking stuff down from the attic and it’s hard for me to get all of them down at one time to go through but that’s what i’ll have to do…eventually. happy new year….looking forward to seeing your posts in 2013! I kept away my Christmas decos, right after Christmas day. Good, that we don’t have the real Christmas tree inside this year, as I am getting allergic into it and hubby had astma. It getting worser when the real Christmas tree, big or small. Thanks for sharing your great tips. We been checking your posts every week 🙂 specially hubby. This is exactly what I need to do. I’m so overwhelmed by all my stuff that I can never find. I need transparent containers too!! Thanks for this post, Yvonne. IMPRESSIVE!!! I love your method! Excellent. Hubby needs to see this. I haven’t decided when our tree will come down. Ours went up late (Dec 21) because my mother has been dying. I didn’t have the energy while sitting with her all day and coming home only to sleep and bathe. Daughter #1 decorated when she was off for the holidays. Mother died on the 28th and the funeral was the 31st. I slept all day yesterday, so today is the first full day that I have been able to enjoy all the beautiful decorations. Our sunroom (w/the tree) looks like a winter wonderland with many of my snowmen sitting about the tree, plants and furniture. Delightful. Thank you. I finally got the virus that has plagued my sister’s family for the past week, but glad to have avoided four the family. I like your thinking. I do find a warm feeling while seeing the decorations. Yvonne, this is genius! I haven’t started putting Christmas decorations away yet but now I’m inspired. This is something I am considering too. My only problem is categorising! I get in a proper kerfufle, especially if something fits multiple categories! Clear bins are such a boon though! Thank you for all your inspiring posts and wonderful photography! Wishing you health, happiness and living your dreams in the New Year! Today is my put away and get ready for next year day, too. I have tried the large tubs and decided to use smaller, clear, and lighter weight containers. The extra information that your readers have sent my way will certainly help. My sister in law gave me a great container that holds my ornaments last year. It made setting up this year easier and the putting away, also. Hi Yvonne, Loved reading this post. I’m a big bin person, but would love a basement to organize such stuff. One further thing I do is take pictures of how I’ve decorated to help give me a jump start in decorating next year. Not that I don’t make changes but life is challenging and I forget from year to year! I print the main pictures on one piece of paper and put that in the storage box o I can find it. I’ll also write a note or two to remind me of something I wanted to remember about the decorations! I probably didn’t need these steps twenty years ago!! Happy New Year! Great minds think alike! I just began converting blue rubbermaid tubs to transparent/clear rubbermaid tubs in various sizes to organize my craft room! I hate not being able to find crafting scissors…ribbon…scrapbook paper…rubber stamps, etc. AND purchasing duplicate b/c I couldn’t find something in a deep box! 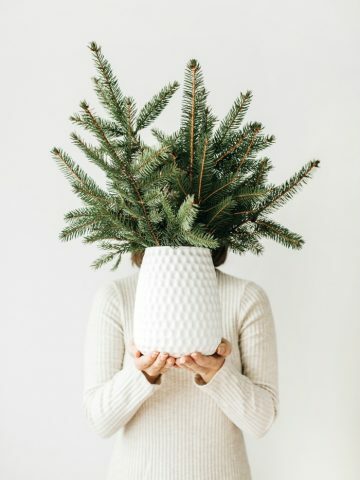 Smart thing to do with Christmas decor as well! Yvonne, that is so smart! My Christmas is all packed up for this year, but I will be implementing your system next time for sure. Thanks for sharing!